On Christmas night, December 25, 2012, the nearly-full moon (95% illuminated) was at conjunction in right ascension with Jupiter at 7:10 pm EST, but their closest approach was at 6:23 pm with Jupiter just 37 arc minutes from the lunar limb. Unfortunately, during the early evening, the sky was largely cloudy in Maple Shade, NJ. This picture was taken at 6:50 pm EST during a slight break in the clouds using a Canon 40D digital SLR camera (on a fixed tripod) and a Sigma 18 to 50 mm f/2.8 zoom lens at 50 mm focal length (then cropped significantly). Exposed 1.6 seconds at f/2.8, ISO 800. Jupiter is barely visible at the 11 o'clock position, slightly more than a moon diameter away. Last Christmas night, 25-Dec-2011 (about 12½ lunations ago), the moon was a day-old crescent. At 1:06 am EST on December 26, 2012,, the clouds were thinning out and causing a lunar corona when this image was captured (also from Maple Shade). Jupiter was now 2½° from the moon (at the 4:30 o'clock position after swinging from the eastern half to the western half of the sky). First magnitude Aldebaran, the eye of Taurus the Bull, is at the 7:30 o'clock position. Canon EOS 40D digital SLR camera (on a fixed tripod) with a Canon 70-200 mm f/2.8L zoom lens at 100 mm (then cropped a little). Exposed 1/4 second at f/4.0, ISO 400. The annual Christmas display at Longwood Gardens in Kennett Square, Pennsylvania, began on Thanksgiving, November 22, 2012, and runs through January 6, 2013. Shown here on December 3, 2012, Jupiter joins the festive lighting looking down this twin row of Baldcyprus trees. The first-magnitude star Capella, in Auriga, is peeking through the branches at the upper-left of the trees. Taken at 5:37 pm EST, about an hour after sunset, with a Canon EOS 40D digital SLR camera (on a fixed tripod) and a Sigma 18-50 mm f/2.8 zoom lens at 18 mm. Exposed 2.5 seconds at f/2.8, ISO 400. At 6:14 pm, just after the end of astronomical twilight, this is the view across the front of the Main Conservatory. The first-magnitude star Aldebaran, the eye of Taurus the bull, is below-right of Jupiter. Beta Tauri, the northern horn tip of Taurus, is near the left edge. Taken with a Canon EOS 40D digital SLR camera (on a fixed tripod) and a Sigma 18-50 mm F/2.8 zoom lens at 31 mm. Exposed 2.5 seconds at f/4, ISO 800. A surprising find during the visit to Longwood was a authentic Porter Garden Telescope that was on display in the Music Room (near the left curtain). However it was missing the primary mirror in the base, as well as the secondary mirror and eyepiece at the top of the stalk. The brass refractor on the right is reportedly a Zeiss. Canon 40D digital SLR camera (on a fixed tripod) with a Sigma 18-50 mm f/2.8 zoom lens at 18 mm. Exposed 1/13 second at f/2.8, ISO 800. 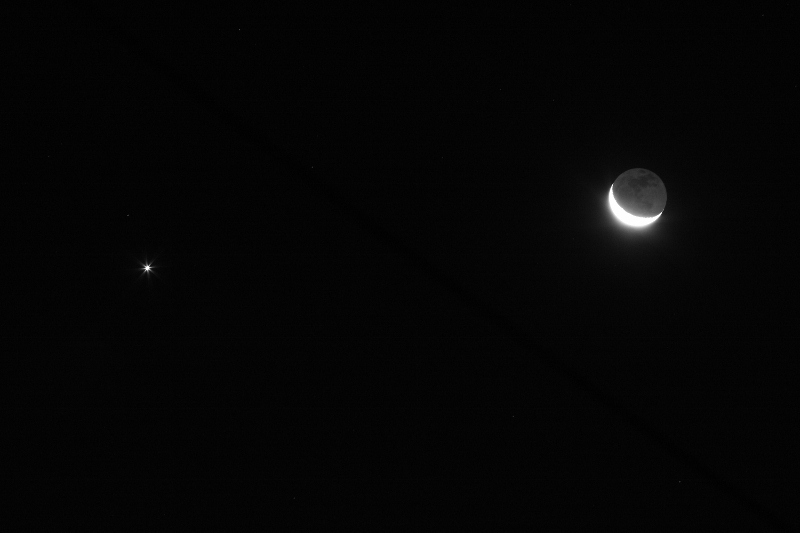 In this picture, the moon and Jupiter were about 2½° apart at 1:33 am EST on November 29, 2012. The moon was full (i.e., at opposition) about 16 hours earlier, on November 28th at 9:46 am EST. Jupiter will reach opposition at 8:45 pm EST on December 2nd. This single frame was taken from Maple Shade, NJ,withha Canon EOSa Canon EOS 40D digital SLR camera and a Canon 70-200 mm f/2.8L zoom lens set to 200 mm focal length. Exposed 1/1000 second at f/8, ISO 400 (handheld), monochrome mode. Cropped and contrast adjusted, but still not as stunning as this close pair was visually throughout the night. After rising about 4:50 pm on the 28th, they reached a minimum separation of about 1 degree (measured from the lunar limb) around 7:00 pm. Jupiter is one of the brightest objects in the night sky, but photographically, it's still overwhelmed by the brightness of the nearly-full moon (the apparent magnitude of the full moon is more than 8,000 times brighter than Jupiter and more than 5 times brighter per unit area, or surface brightness). The eye handles this wide dynamic range much better than photographic sensors. On November 24, 2012, at 4:33 pm EST (several minutes before sunset), the 88% illuminated waxing gibbous moon hovers over the eastern end of Carranza Field in Wharton State Forest, NJ. Taken with a Canon EOS 40D digital SLR camera and a Sigma 18-50 mm f/2.8 zoom lens set to 18 mm focal length. Exposed 1/125 second at f/6.3, ISO 400 (handheld). The sighting on November 23, 2012, concludes this year's effort and extends the streak of sightings to thirteen elongations in a row for 2011 and 2012. The morning started off with a layer of fog in the distance (obscuring the middle of the nearest power transmission towers), but that cleared to a large extent after 6:00 am. The position of Mercury was not difficult to establish by extending a diagonal line down from Venus through Saturn, but Mercury's position was confirmed by the sighting of Zubenelgenubi and Zubeneschamali (the detached claws of Scorpius, Beta and Alpha Librae) above-left and above-right of Mercury respectively. Zubeneschamali was confirmed by the sighting of Alpha-1 above Alpha-2 Librae (they are numbered from the west rather than by increasing brightness). On December 3, 2012, Mercury was spotted with unaided eyes as clouds broke up during dawn. Venus was almost exactly equidistant between Mercury (below) and Saturn (above), 7¼° in each direction. On December 6, 2012, the sky was quite clear and Mercury (at magnitude -0.5) was obvious to the unaided eye in the morning twilight from 6:00 to 6:30 am. Although October 11, 2012, is listed above for sighting #5 (with 16x70 binoculars), Mercury was probably first seen for this elongation on October 6th at Camp Ockanickon in Medford, NJ, with 10x42 binoculars. At the time, the object seen was presumed to be Saturn with nearby Mercury below-left of it behind the trees. However, it was probably Mercury with Saturn unseen above-right of it (because, among other reasons, I didn't search in that direction!). I should have known it at the time, but as October 11th's observation made clear, Mercury was about a magnitude brighter than Saturn. In any case, the sighting of the 6th doesn't count since I wasn't cognizant of the actual identity at the time. Like the night of August 12/13, all eight planets (including earth) were observed overnight on October 11/12, 2012, plus the asteroids Ceres and Vesta (16x70 binoculars) and comets 168P/Hergenrother and 260P/McNaught (12.5-inch Newtonian). On October 16, 2012, Mercury was spotted again (with 16x70 binoculars) next to a sublimely thin, 34.5-hour-old crescent moon. The ecliptic after sunset is at an unfavorably low angle this time of year. On top of this, on October 16th, Mercury and the moon had an ecliptic latitude of more than 2 degrees south. In addition to the sighting of Mercury on the morning of August 13, 2012, a heliacal rising of Sirius was observed, initially with 16x70 binoculars at 5:23 am, and then with unaided eyes at 5:25 am. This is several days earlier than last year's initial sighting on August 16th. Undoubtedly, it could have been seen at an earlier date, but on four previous attempts this month, clouds along the eastern horizon foiled my efforts. After a particularly cloudy summer that really hampered astronomical observations, the night of August 12/13, 2012, was really fine. Billowing Milky Way was seen at Belleplain State Forest, a score of meteors (mostly Perseids) was observed, even though much of the time was spent at the eyepiece. To top it off, all eight planets (including earth) were spotted overnight. Here's the setting sun at Whitesbog, NJ, on October 14, 2012. The cloud patterns precluded any chance of spotting Mercury above the tree tops after sunset, but they were certainly photogenic. Taken at 6:14 pm EDT with a handheld Canon 40D digital SLR camera and a Sigma 18-50 mm f/2.8 zoom lens set to 50 mm focal length. Exposed on full auto (1/500 second at f/10, ISO 400). Can't complain about the clouds on this Sunday evening. The three previous nights were clear, so I had my scope out to the Pines each of those nights, and each time was able to observe comet 168P/Hergenrother and its movement against the background stars. 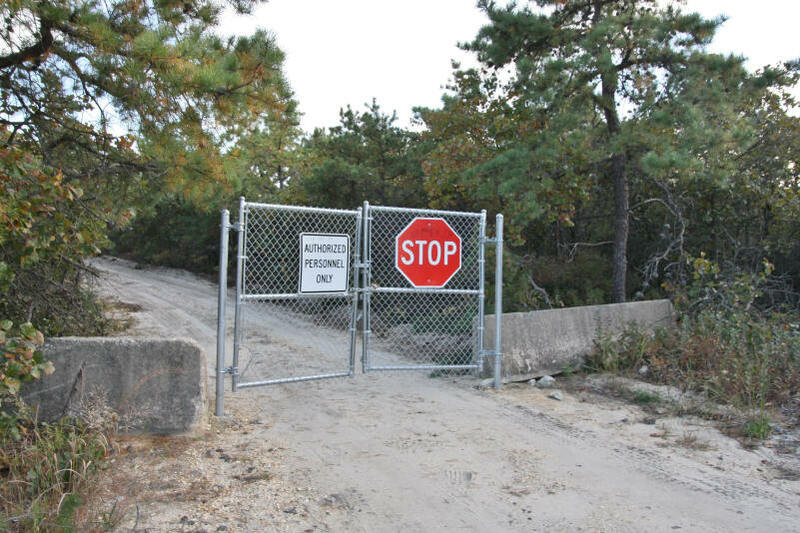 During a trip to the New Jersey Pines on October 14, 2012, I stopped by the entrance to Coyle Field, a popular observing site for amateur astronomers in the region until December 2011, when access was restricted. This is the view at 5:27 pm EDT, taken with a Canon 40D digital SLR camera and a Sigma 18-50 mm f/2.8 zoom lens at 18 mm. My last observing session there was on November 8, 2011, for the pass of near-earth asteroid 2005 YU55. The Great Comet of 2013? At 4:00 am EST on the morning of November 7, 2013, Comet C/2012 S1 (ISON) will be about 16° above the eastern horizon between Leo and Virgo as it heads eastward down the ecliptic (the blue diagonal line) towards the sun and perihelion on November 28, 2013. The current orbital elements based on a nine-month arc should provide a reliable position, and there is reason to believe this comet will become very bright with a long tail around perihelion (it could well be a naked-eye object in this view). However, comets are notoriously fickle, so we'll have to wait a while to see how bright it really gets. This chart was prepared with SkyTools 3. On the morning of September 12, 2012, the center of the 16% illuminated crescent moon, with earthshine, was just 4.4 degrees to the right of the planet Venus. Taken at 4:42 am EDT from Maple Shade, NJ, with a Canon 40D digital SLR camera and a Canon 70-200 mm f/2.8L zoom lens (on a fixed tripod) set to 140 mm focal length, then cropped moderately. Exposed 2 seconds at f/5.6, ISO 400, in monochrome mode. Move your mouse cursor over the image to see fainter M44 (the Beehive Cluster) about 2.7 degrees to the left of Venus (4:34 am; same camera and lens, but exposed 4 seconds at f/4, ISO 1000). The Full Moon on the evening of August 31, 2012, has been called the "Blue Moon" because it is, in the modern use of the term, the second full moon of the month, not because of any peculiar coloration. The first full moon was on August 1st at 11:27 pm EDT and the second was on August 31st at 9:58 am EDT. Since this image was captured at 10:32 pm EDT, it's actually 12½ hours after the exact moment when full. 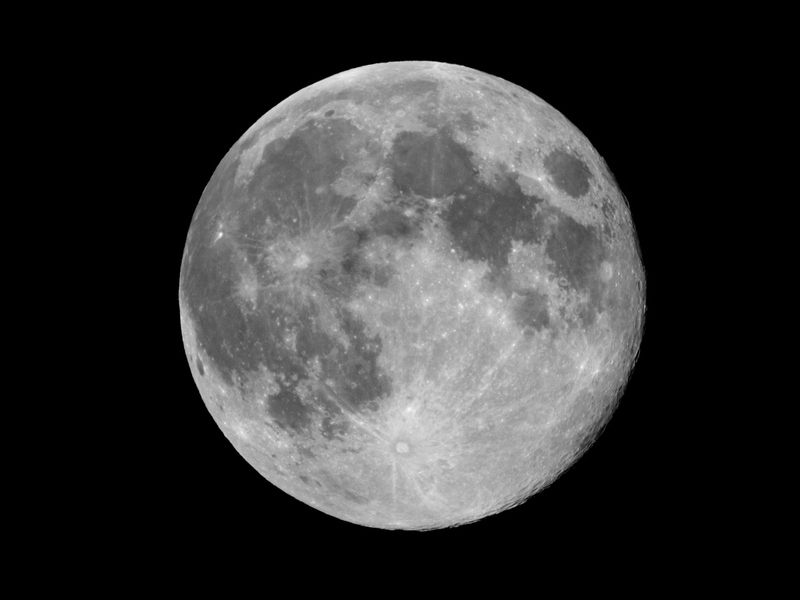 Taken from Maple Shade, NJ, with a Canon 40D digital SLR camera and a Kenko doubler through a William Optics 80 mm, f/6 apo refractor on a fixed tripod. This single, full-frame image was exposed 1/350 second at f/12, ISO 400, in monochrome mode. Oriented with the zenith up. Click the image for a larger version.